Does it get any better than Douglas Manor in Queens? Douglas Manor is a beautiful neighborhood in the extreme northeast corner of the borough. This section of Douglaston is geographically secluded, on a peninsula that juts out into Little Neck Bay. It's also a quick train ride to the city. Actually, since it’s in Queens, this is New York City. 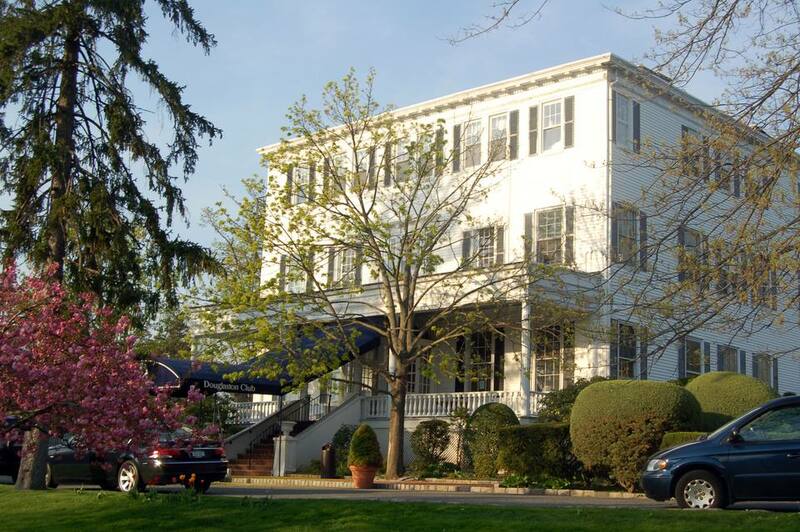 The town, known to residents as simply the Manor, was founded in 1906 and named for the estate of George Douglas (his 1819 Greek Revival mansion is now the Douglaston Club, 600 West Dr. at Manor Rd. ), who filled the peninsula with plants and trees from around the world, with the help of his friend, famed NYC landscape architect Samuel Parsons Jr. This and the Manor’s varied architectural styles helped it gain its status as a New York City historic district in 1997. The garden community created by the Rickert-Finlay Realty Company (which bought the land from George Douglas’s son William) was intended for the middle and upper-middle classes. Douglas Manor is hilly and laid out in a curvy grid. This photo shows Little Neck Bay and apartments in Bayside, Queens, across the water. This is a view from the front lawn of the Douglaston Club. Douglas Manor was created with strict deed rules, but unlike in communities like Forest Hills Gardens, there was no restriction on architectural style. As a result, many early-20th-century styles are represented in the Manor’s 600 homes -- Tudor Revival, Craftsman (including homes by Gustav Stickley), Colonial Revival, Queen Anne, Mediterranean Revival, English Country Cottage -- even Sears mail-order. There are also eight homes built by Josephine Wright Chapman, one of the most successful female architects of her time. Tennis great John McEnroe grew up just up the block from here. Before Douglas Manor was a country estate, it was a Dutch farm; the oldest house in Douglaston is a privately owned 1735 Dutch Colonial home on West Drive (the landmark Cornelius Van Wyck House). Udall’s Cove is one of the last undeveloped tidal salt marshes in northern Queens County. Memorial Field (Douglas Rd at Richmond Rd), with its playground, baseball diamond, and basketball courts, is cooperatively owned by the Douglas Manor residents, along with the mile-long shoreline and the town dock. The Douglas Manor Association maintains the field and dock. There are two ways into the secluded Douglas Manor: Douglaston Parkway north of Northern Boulevard, and Sandhill Road, known to locals as the Back Road (just off Douglas Rd at Oak Ln). What used to be a street riddled with tank traps (and too often a dumping place) is now a neatly paved scenic road. Just up that hill is the Little Neck LIRR station on Little Neck Parkway. This pond was named after Manor resident Aurora Gareiss, who fought to protect the wetlands from dumpers and developers in the 1960s. It was restored in 2006, and hiking trails were added. Aurora Pond: Same as above, but make first left off Little Neck Pkwy onto Sandhill Rd. There is no parking on the Back Road, so you need to park in the Manor, on one of the streets off Douglas Rd, and walk down the hill. Habitat for clapper rails, snowy egrets, and osprey; fowler toads, frogs, salamanders, and snapping turtles. Several short hiking trails wind their way through the preserve, offering views of the ravine, cove, and Little Neck Bay. Douglas Manor’s shoreline is cooperatively owned by the Manor's residents. They can often be seen strolling along the water, taking in views of Little Neck Bay and the Throgs Neck Bridge. At the town dock (Shore Rd at Beverly Rd), local kids can take sailing lessons and swim in the bay (with sandals -- the beach is covered with rocks and broken shells). There has been controversy about the safety of the water. According to the NYC Department of Health and Mental Hygiene’s beach report, in the summer of 2008, Douglas Manor beach was closed on 35 days due to pollution. The city is now building a sewage retention tank near the beach. Many Manor residents say they have been swimming in the Bay for decades with no adverse health effects. Il Toscano (42-05 235th St, Douglaston) is not officially in the Manor, but just on the other side of the Douglaston LIRR station. It's one of the best restaurants in Queens. A couple of doors down from the upscale Italian eatery is the popular George Martin’s Tap Room (42-15 235th St, Douglaston; fka F. Scott’s, fka in the olden days the Weeping Beech). Near Northern Boulevard, there's the wallet- and family-friendly Giardino (44-37 Douglaston Pkwy, Douglaston). Visit This Dynamic and Exciting NYC Neighborhood! Thinking of Staying or Visiting Manhattan's UES?